The 2017 Eldora Dream Payout is dense. Tonight alone, it’s a $250,000 purse. The total for the weekend is near $400,000. View full 2017 Dirt Late Model Dream Results below. This is a spoiler free race report, written live as it happens. 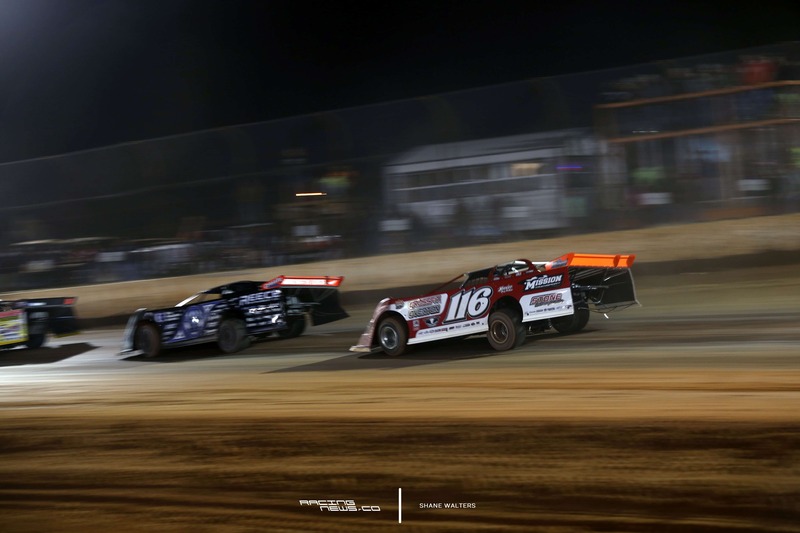 Click Here to view heat race lineups for the Eldora Speedway Dream. Green flag. Gregg Satterlee and Jimmy Mars lead the field into turn 1. Satterlee low, Mars through the middle. They run side by side, two straight laps. Jimmy Mars finally clears Satterlee. Bloomquist runs 4th, top 3 transfer. Devin Moran runs 3rd. Bloomquist is there, 5 to go. He’s inside of Moran. Moran powers back around on the outside. 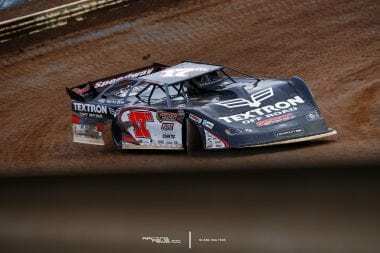 Bloomquist tries it again. He clears him, Bloomquist is into the final transfer spot. Caution, Kyle Bronson came all the way from Florida, he has a flat. Simpson is struggling, he runs toward the back. Green, 5 to go. Mars to the highside. Bloomquist is coming, he’s around Satterlee who got bottlenecked on the bottom. Caution, Jimmy Owens is around. Chris Simpson is suddenly up to 6th. Green, 4 to go. Satterlee had a run on Bloomquist, he’s force to back out, he loses a spot to Moran. Meanwhile, Bloomquist has gone up to fight for the lead, he’s there. A mistake, Bloomquist loses a bunch of ground to Mars, Moran is on the bumper of Bloomquist. He doesn’t make the move. At the front, Mars is gone, he wins heat #1. Bobby Pierce starting on the outside, leave the field. He’s gone. Caution. Oh no! Big problems, Bobby Pierce is in the wall! Flat tire, torn spoiler and a destroyed fender. He blew a tire in turn 1, inches from the wall, he didn’t have far to travel until he hit the wall. Pierce returns to the track, his right-rear is destroyed. Green. Shannon Babb checks out. Bobby Pierce is slow on track, caution. Green, 3 wide for the transfer spot, Madden, Hoffman, Francis. They settle it, Madden to 3rd. Jeff Babbcock is coming on the highside. Babbcock in the Best Performance Motorsports machine, started 10th, he runs 5th. Backcock pulls a slider on Hoffman, he’s up to 4th. The top 3 aren’t in the frame, gone. Shannon Babb is going to win heat race number 2! Billy Moyer Jr was suppose to start on the front row. He pulled out of staging, lost his front row starting spot, Moyer Jr will start at the tail. Mason Zeigler check out on the highside. Dennis Erb Jr and Darrell Lanigan race for 2nd. Erb prevails on the top. Mason Zeigler is in a lead of his own. Meanwhile, Darrell Lanigan wants more than 3rd. He’s all over Dennis Erb Jr, slide job. He clears him by inches, move Lanigan up to 2nd. Mason Zeigler picks up where he left off last night, he wins heat 3. Jonathan Davenport gets a terrible start. He was hanging back, trying to slow the start on the outside. He was suppose to start on the front row, he was running 5th, before they ever through the green. Brandon Overton leads. 9 to go, McCreadie is fighting Jake O’Neil for 2nd. They run side by side, they better figure it quick. Billy Moyer has climbed to 4th. 4 to go, McCreadie finally clears O’Neil with a slider in turn 1. Moyer Sr carries speed around the top in turn 1. He diamonds the exit, a crossover. Billy Moyer Jr low on O’Neil in turn 3. Moyer Sr takes the spot. Brandon Overton wins. Green. Hudson O’Neal clears him again. This time it’s before the flagstand. Hudson O’Neal leads. Woah! He slides loose, nearly lost it. He maintains the lead. Robinson is there too. 3 wide! Hudson O’Neal falls to 3rd. Kent Robinson leads, Zack Dohm 2nd. Meanwhile, Don O’Neal pulls off, he’s 5th in points, he’ll transfer no matter what. A smart move to save tires or maybe he had a problem? Kent Robinson wins heat 5! Timothy Culp leads the field in heat 6, the final heat of the night. 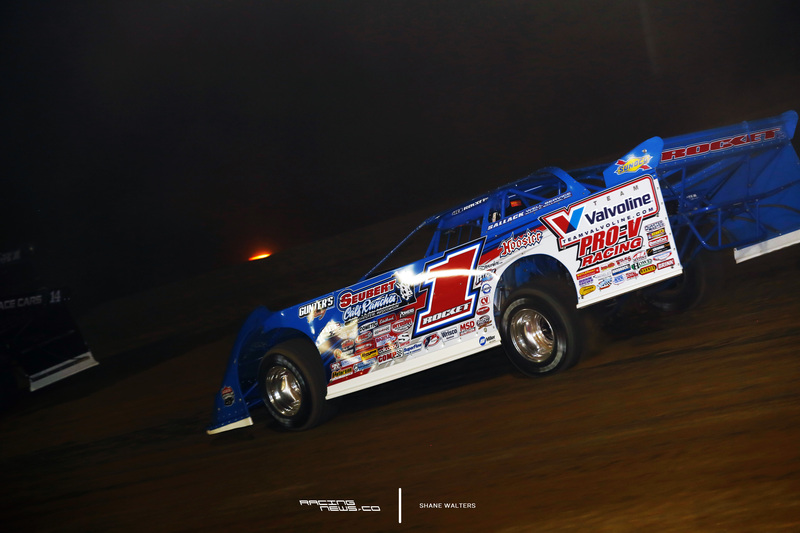 Brandon Sheppard is looking to take the runner up spot from Mike Marlar. Marlar falls back to the bottom, takes the line away. Marlar holds off Sheppard. Timothy Culp is slow! What?! He led flag to flag, the car comes to a stop with 1 to go. Still green, Marler steals the win! He will start on the pole for the $100,000 to win main event. Culp says he lost a transmission. Don O’Neal and Chris Simpson are the provisional starters right now, based on points. However, Chris Simpson lost an engine in the heat race. He doesn’t have to run the B-Main. The crew does need to finish changing the motor in time to make the feature. It has to be the same car. If he can’t make it, Shane Clanton will get bumped into his provisional. Track prep underway ahead of the B Features at Eldora Speedway. Water trucks circle the top of the speedway. Green, 20 laps. Dale McDowell swings around Satterlee at the start. Jeep VanWormer carries highside momentum, he picks up 2nd as Satterlee struggles to keep his forward drive. Shane Clanton around Satterlee for 3rd. Satterlee holds 4th, the final transfer spot. They swarm behind him. Billy Moyer Jr has pulled off. 10 to go, McDowell leads by 10 car lengths. Satterlee has right rear damage. They are two wide behind him. Hawkins with a slider, he takes the spot. Satterlee returns the favor in turn 1. Satterlee parks it in front of Hawkins, he drives up the fuel cell of Satterlee. Caution. Saterlee coasts to the pit lane, flat left rear. Hawkins has lost his hood from the incident, it flew off and over the fence. Green, 4 to go. Satterlee is back on track. Dale McDowell leads the field, clears everyone by 5 at the exit of turn 2. Problems for Jeep VanWormer, broken right front suspension. He was running 3rd. Second night in a row the wall has removed VanWormer from a transfer spot. Green, 3 to go. Dale McDowell and Chase Junghans check out. Jackie Boggs runs 5th, he looking for a spot in the main. He slips. Tyler Erb slides, right into a transfer spot. Shane Clanton hangs on to fill the final transfer spot. Eddie Carrier Jr wins B Scramble number 1. He takes home $1,000 for his efforts. Bobby Pierce is in this one, he starts at the tail after wrecking from the lead in his heat. Babcock gets the early jump on Jake O’Neil. As the field stacks up on the top, Davenport to the Bottom. Davenport to 4th. Davenport and Henry run side by side, they are both catching O’Neal. Davenport will have to find a new line, O’Neil is blocking the top. Caution, spinner. Green, 15 to go. 4 wide for 3rd. Steve Casebolt picks up a bunch of positions. Davenport falls to 5th. Caution. Bobby Pierce is up to 17th. Green, 14 to go. 3 wide for 3rd. 4 wide for 4th. Davenport is back to 3rd on the bottom. Casebolt runs side by side with Davenport, Casebolt tags the back straight away wall, everyone continues, just close racing. Caution, spinner and a pile up, Tim Lance is around. Bobby Pierce just barely squeaks past, between Lance who was going backwards up the track and the wall. Green, 13 to go. Babcock slips on the restart, he falls to 3rd from the lead. Babcock is to the inside of Davenport. Davenport wins that battle. Pierce is up to 9th, he coming fast. Donald Mcintosh is the next one to look at Babbcock. They run side by side. 5 to go, Bobby Pierce picks up two spots at once. He’s bouncing it off the cushion, carrying momentum around everyone. Bobby Pierce is to the outside of Casebolt, 5th. 3 to go, he’s gotta get one more position and he’s into the main! White flag, he’s to the outside of McIntosh, 3 wide for 3rd. He got it! Bobby Pierce finished 4th, top 4 transferred for the 25th starting spot. The crowd is excited. Jon Henry wins. Brian Shirley wins B Scramble number 2. He takes home the other $1,000 check for his efforts. He doesn’t get to start the main event but at least he heads to victory lane at Eldora. Track crew go to work on the track ahead of the 100 lap main event. Watered, top to bottom. These first few laps are going to be special, ice racing. $16,718 is handed to the 50/50 winner. Green flag. Mike Marlar leads the field to green. 100 laps around Eldora Speedway. Marlar runs the middle, Kent Robinson drives around the outside, new leader, Kent Robinson. Overton runs 3rd. Big slide from Shannon Babb. Bloomquist is under him for 6th. Brandon Overton is under Marlar for 2nd. Overton is on the move on the bottom, new leader, Brandon Overton. Caution, flat right rear tire on Mason Zeigler, he was running 5th. 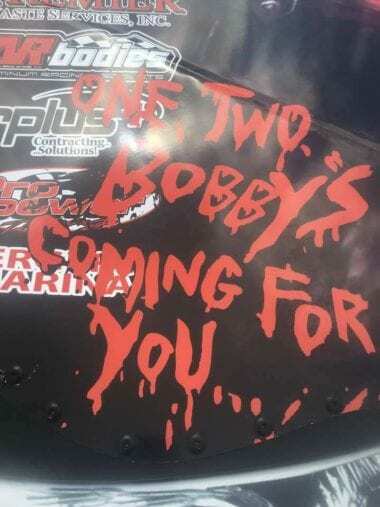 Bobby Pierce is up to 20th. Green, 88 to go. Kent Robinson bobbles up the race track. 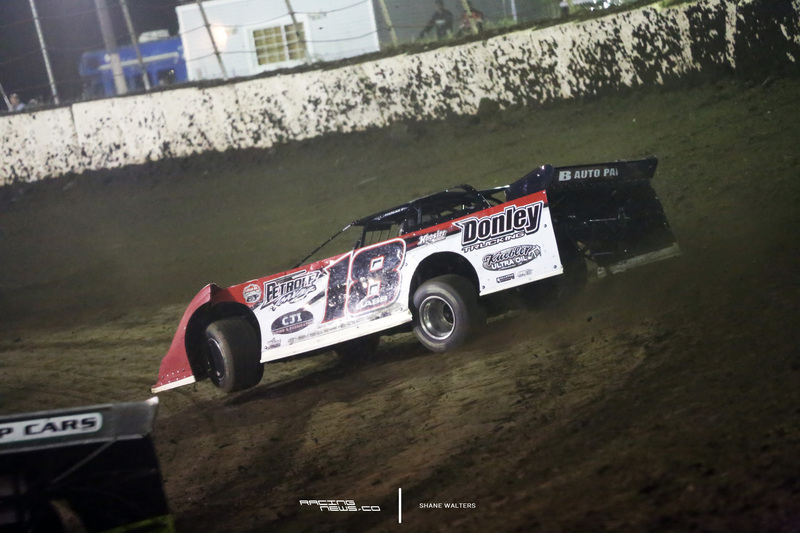 He leaves the bottom open, Bloomquist fills the hole, rolls passed on the bottom. Bloomquist up to 2nd. Frank Heckenast Jr is slow on the track. Caution, Heckenast has steam flying from under the hood on pitlane, broken fan. Green, 86 to go. Bloomquist gets a bad restart. Overton clears him by 5 car lengths. 3 wide for 4th. Darrell Lanigan on the bottom, Mars in the middle and Robinson up top. Mars picks up 2 spots. 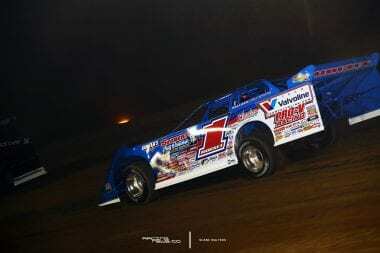 Brandon Sheppard is on the charge. He working on Marlar for 3rd. Brandon Sheppard, riding the cushion, takes the spot. The track is looking darker again. 80 to go, Bloomquist is running down Overton. Both of these drivers are running on the bottom to the middle, same line. They mirror each other after lap. The leaders have caught lapped traffic. Overton slices through them, high and low, Bloomquist follows. Brandon Sheppard is chasing them both down. Big bump is forming at the bottom in turn 1. 67 to go, Hudson O’Neal is running the same line as Bloomquist. The #0 is held up. Brandon Sheppard see’s it coming, he moves to the top. 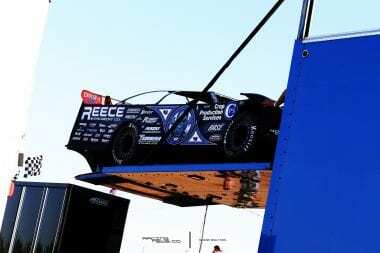 He boxes Bloomquist in behind the lapper, takes the 2nd place position. Sets sights on Brandon Overton. 62 to go, Bloomquist has found speed again. He trails Sheppard. Lappers running high ahead. This time it’s Sheppard the one that’s boxed in behind a lapper. Bloomquist back to 2nd. Now, Bloomquist is chasing Overton. Caution, Tyler Erb is stopped on track. Darrell Lanigan is also in the pits, overheating. Green, 57 to go. Bloomquist looks low on Overton, can’t get it done. 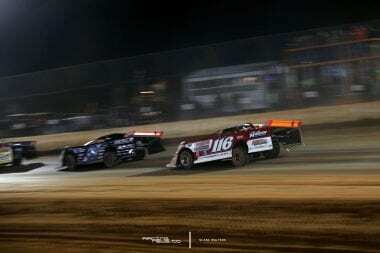 Bloomquist backs off the throttle, Brandon Sheppard has a hole up high, he takes it drives back around Bloomquist. Tim McCreadie is into the picture. 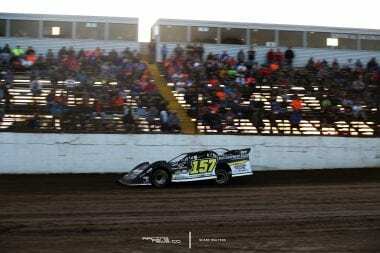 To the outside of Bloomquist, McCreadie takes 3rd. 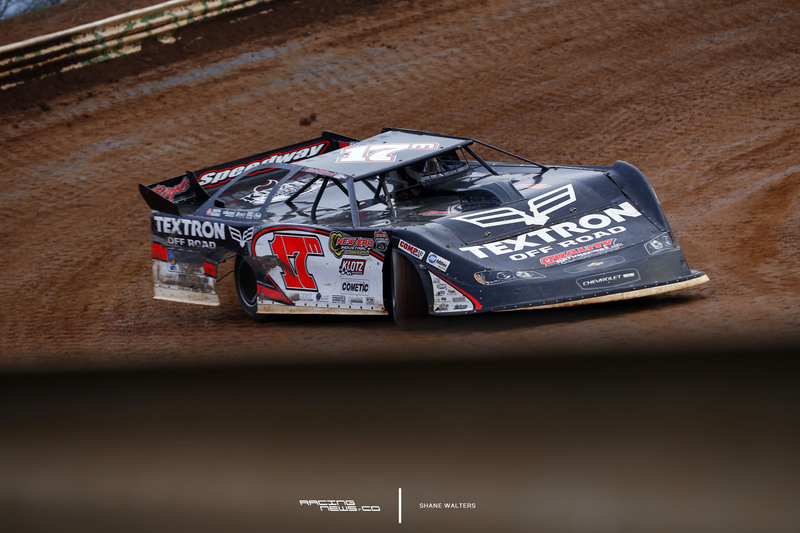 Bloomquist still glued to the bottom, he’s back around Tim McCreadie. Bloomquist isn’t good on restarts until the tires warm up. He’s back up to Brandon Sheppard, side-by-side. Lap after lap, still side by side. Sheppard drifts high, loses a bit of ground. Bloomquist completes the pass. Sets sights back on Brandon Overton. 45 to go, Overton wiggles. He drifts from the middle to the top. 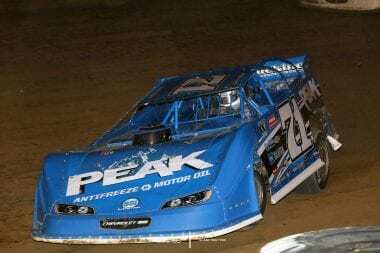 Bloomquist is still strong on the bottom. He’s there and he’s the new leader. 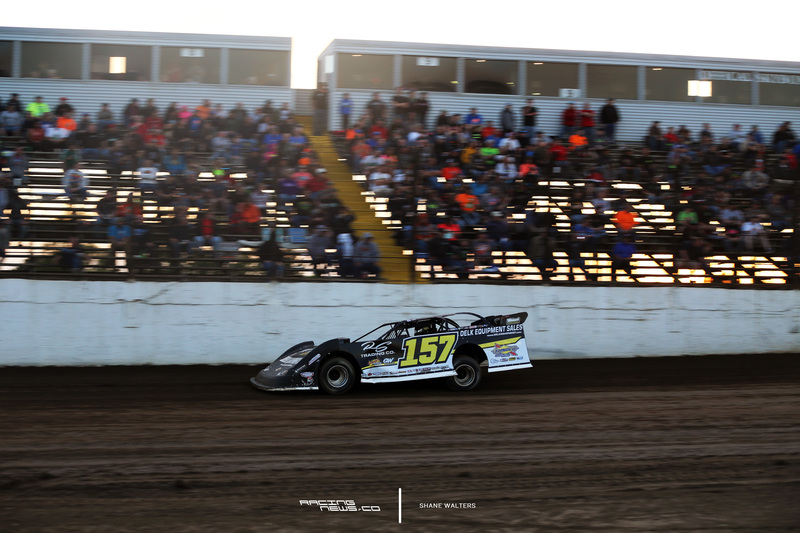 Bloomquist to the front of the Dirt Late Model Dream field. 30 to go, long green flag run here. Sheppard is now looking to take 2nd. He’s side-by-side with Overton. Sheppard low, Overton high. The track is black, top to bottom. Overton hangs onto it. 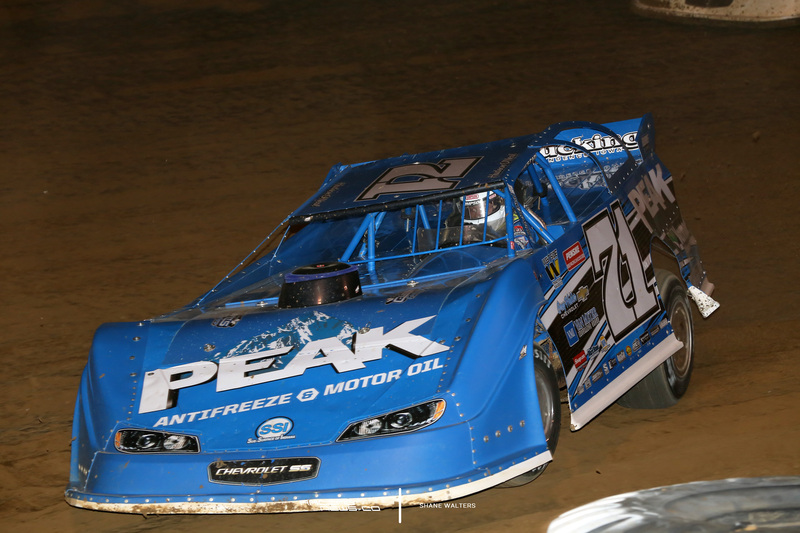 24 to go, Scott Bloomquist just lapped Kent Robinson, who started in the front row, he’s lapped up to 17th place. Bobby Pierce runs 12th, Chris Simpson runs 13th, both of these drivers started at the tail. 19 to go, Bloomquist has checked out on the field. Brandon Sheppard is running down Overton, again. Denied. Tim McCreadie is there as well. McCreadie gets a great drive off turn 2, not enough. A lap later a better drive off turn 2, lower in 3 and 4. Give the spot to McCreadie. Sheppard takes it back! 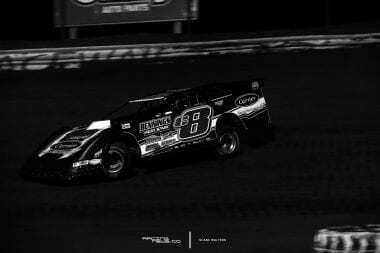 10 to go, Scott Bloomquist is gone. He’s a 1/2 track ahead of 2nd. 6 to go, Brandon Overton and Brandon Sheppard continue to battle for 2nd. Overton over drove the entry, slides up the track, chasing traction. Sheppard has nothing but drive off the corner, he drives right on by. Sheppard to 2nd. 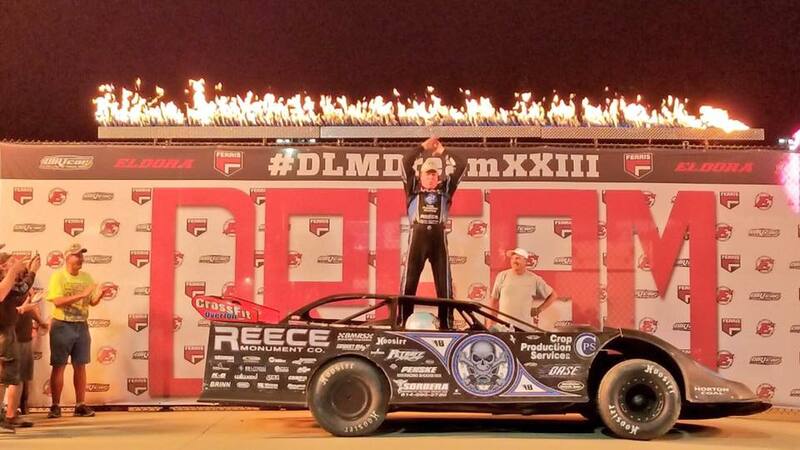 Meanwhile, Scott Bloomquist is going to pick up his 7th Dirt Late Model Dream victory at Eldora Speedway! View full 2017 Dirt Late Model Dream results below.